A hand-written note, with the recipe for “Mac & Cheese popcorn” – isn’t the card cute! Ahh, I love it! Mrs. Campbell’s Chow Chow (the hot version) – I have heard of chow-chow before, but have never tried it. I haven’t had a chance to try it yet – it sounds fantastic for burgers & hot dogs – so I plan on bringing it along to a cookout we have this weekend. Vigo Red Beans & Rice – I love these because they’re so quick and easy to make when you need a quick side dish. Yum! Pirouline ‘cookies’ – These are delicious and great for a quick chocolate fix! A bag of unpopped popcorn – Perfect!!!! Chocolate Covered Espresso Beans – I love my coffee in the morning…and I love chocolate…so obviously this is a great combination! Foodie Penpals is open to US, Canadian & European residents. Please note, Canadian Residents will be paired with other Canadians only. Same with Europeans. This is because things might get too slow and backed up when trying to send foods through customs across the border from US to Canada and vice versa. It’s safe to say that we are definitely into autumn now. The leaves up here are starting to really change color (though we’re nowhere near peak yet) and it’s been raining since just before my band marched onto the field for halftime on Friday night. When reading a few of the blogs I follow, one author noted that they only have about 2-3 more weeks to go until the end of the CSA. I quickly checked my calendar…we have 3 more weeks to go, the last pick-up day being October 22. Wow…the season sure flew by fast! Thankfully though we are nowhere near temperatures for s-n-o-w and I am really feeling for those who live out west who have 48 inches of that awful stuff already! My goal this week is to do more legitimate cooking, instead of preserving and ordering take-out. You’d think a month into school I’d be into some sort of routine, but I’m still not. 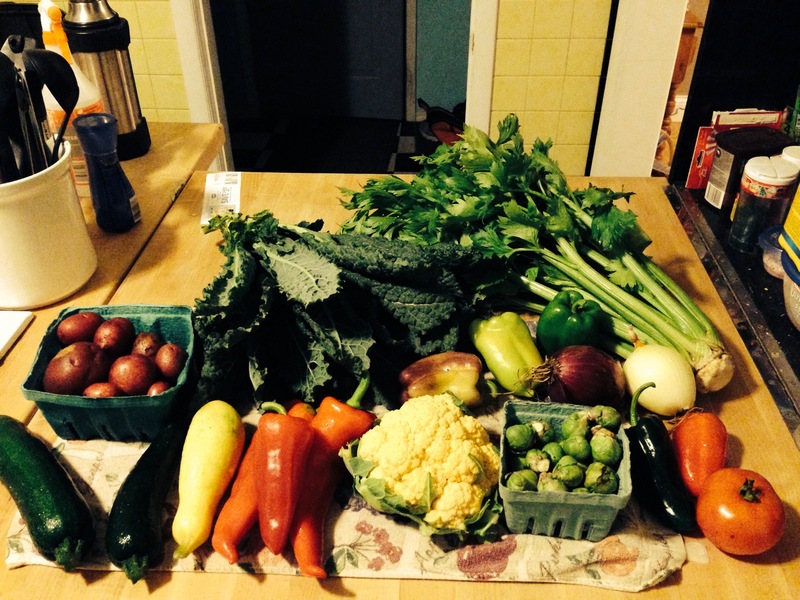 ::sigh:: We at least got another nice, colorful haul from the farm this week! I’m actually kind of glad to see some lettuce again, and that the tomato supply is still in some abundance. Lots of salads this week for lunches! My tomato plants I believe will be officially ‘done’ this week – I have a pan of cherry tomatoes roasting in the oven as I type, and I just finished yet another quart of tomato sauce. Any recommendations out there for usage of beet greens? 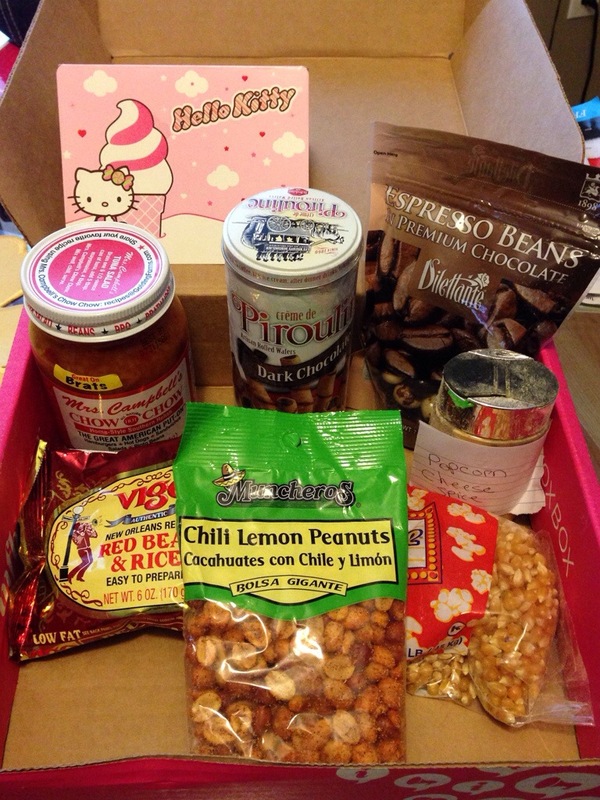 As you may have noticed, I haven’t done a Foodie Penpal box in a month or so. Truth be told, I wanted to take a little break from it and try something different. Enter the Conscious Box. 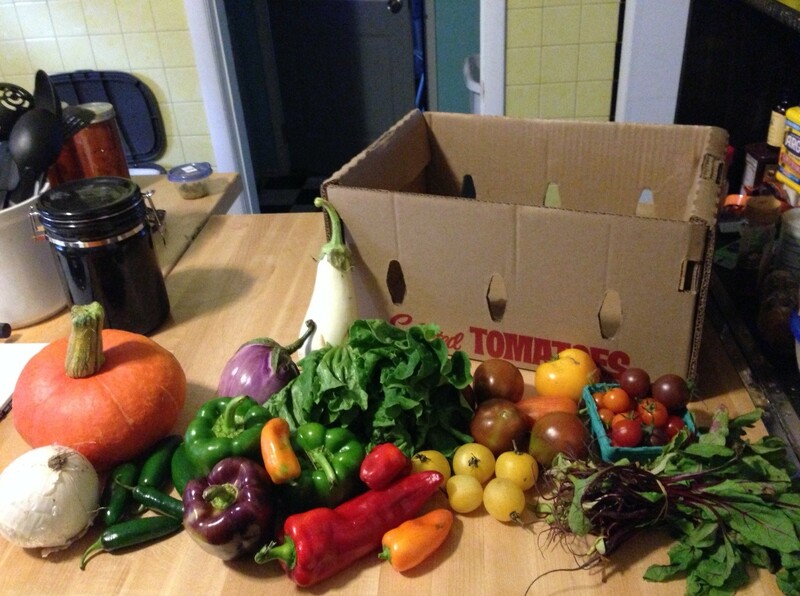 Conscious Box’s main ‘shtick’ is to send out samples of produces that are organic, all-natural, and eco-friendly. This is a great find for anyone who is interested in ‘trying before you buy’ – especially when it comes to these ‘better-for-you products’ that you’re not sure you’ll like. I first heard about Conscious Box from, well, somewhere. I honestly can’t remember, but I do remember that it was several months ago and I was curious to see what it was all about. I figured I’d try it once I got tired of doing FP. I liked them on Facebook, and last month they posted a promo code of some sort. Which, in turn, led me to subscribe to the box for a few months – just to see what would come my way. 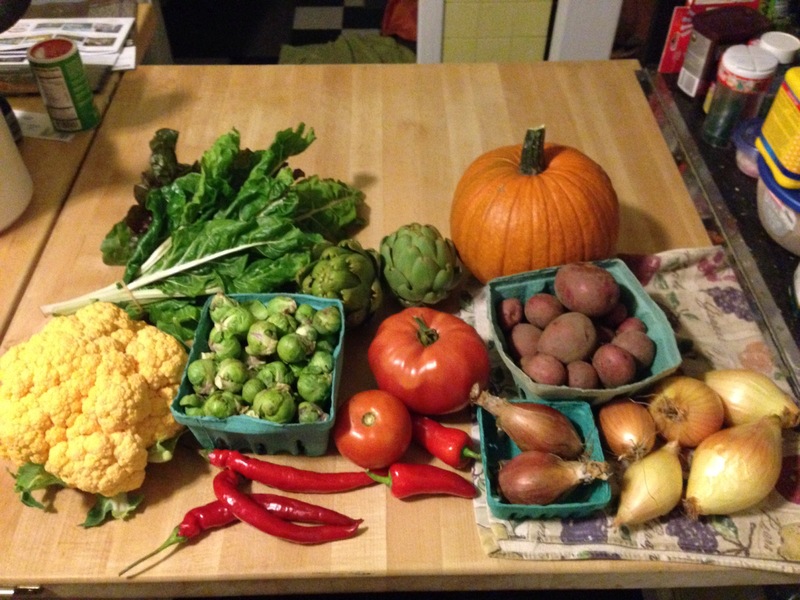 Since my husband and I are becoming more interested in organic/clean eating, as well as eco-friendly products, I knew that this would be money well-spent. There had to be something in the coming box that I would really enjoy or be excited about. Equal Exchange Fair Trade & Organic Chocolate – delicious dark chocolate that is actually vegan, soy-free, and gluten-free – and has only 5 ingredients. This was great for an afternoon chocolate craving that I had. Ecover Automatic Dishwasher Tablets – I am all about natural cleaning products so I was excited to receive these! I paired these with a white vinegar rinse in my dishwasher and they worked pretty well. Orgain Healthy Kids Organic Nutritional Shake – I didn’t try this, but my husband put it in his lunch at work. He’s 6’4″ and it kept him pretty full until dinnertime. I think that says a lot! Clean Ethics Bottle Bright Water Bottle Cleaner – This is my favorite product in this box so far. I love my Nalgene bottle, but find it hard to clean – and I hate putting it in the dishwasher. This product is very user-friendly and left no icky residue or odor in the bottle. My water bottle was in desperate need of a good cleaning and this product, just by dropping it into my water bottle (filled with warm water), made it practically sparkle! The website boasts that it’s good for coffee mugs, too – a necessity for the school year. Granted, there are a lot of products in this box – we haven’t gotten to everything yet! 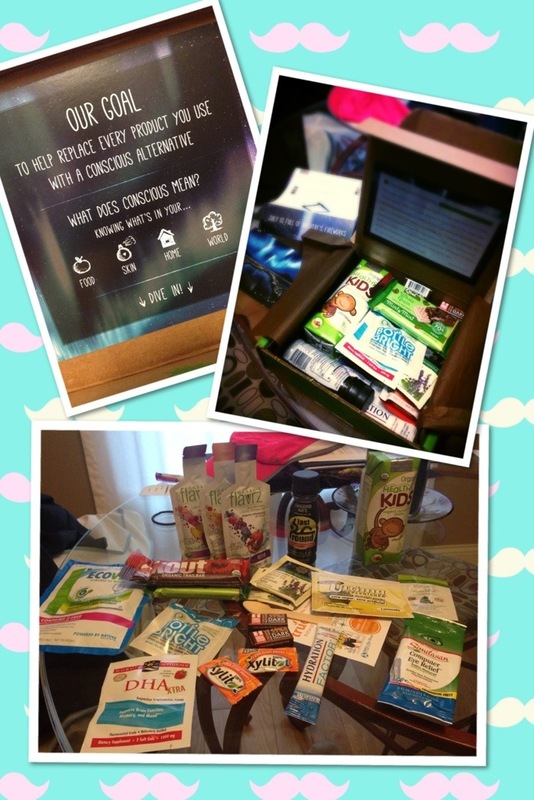 I’m happy to say that I really enjoyed July’s Conscious Box and I am looking forward to seeing what August has in store. You will be seeing at least two more posts about Conscious Box, as I got a sweet deal on a 3-month subscription. As I said before, it’s a great way to try eco-friendly and organic/natural products, before you buy them in a store and see if they work for you – especially if you are considering changing your lifestyle into one that uses these types of foods & products. 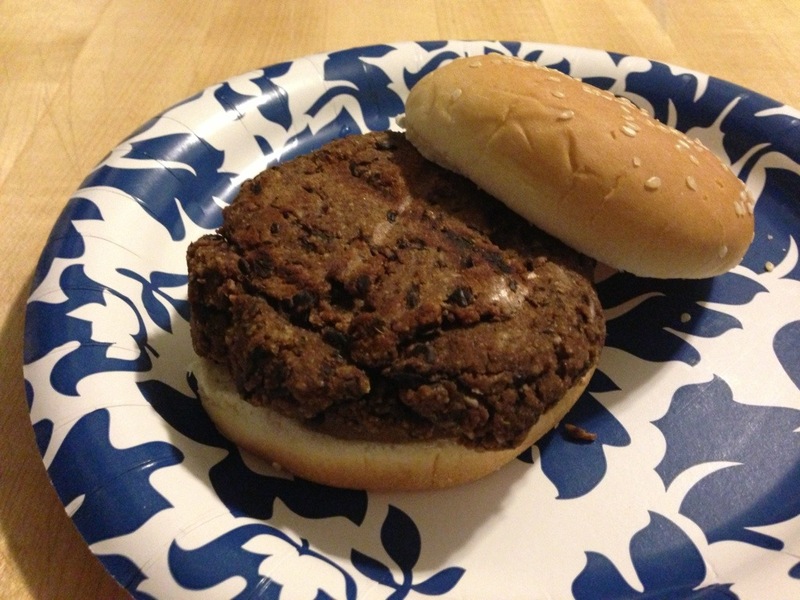 Thus, when my husband suggested that we bring veggie burgers to our weekly garden potluck, I was a bit unsure of what to do. In our attempt to start eating healthier, I knew I had to give the veggie burger a chance at some point or another. I suppose I had always been under the impression that a) they were expensive and b) probably tasted like cardboard. I found this recipe online (as I do like 75% of the time) and noticed that I had all the ingredients on hand – SCORE! I wanted to make 8 patties, total, so I doubled the recipe to suit our needs. I plugged in my Kitchenaid mixer (my new favorite way for mixing burgers & meatballs), and got to work. In a large bowl, scrape in the bean mixture, along with the breadcrumbs. Add rind & remaining ingredients. Mix well. Divide the bean mixture into 4 equal portions, and form patties. From here, you can seperate them with wax paper and refrigerate, or put onto a plate and wait to either pan-fry or grill. PAN FRY METHOD – Heat some olive oil in a skillet, on medium. Add patties to pan; cook for 4 min on each side until the bottom edges are browned. Flip and repeat. GRILL – Spray a sheet of foil with cooking spray. Lay that onto a grill and let the grill heat up. Cook the burgers on each side until browned. My husband walked in the door just as I was fixing these up – and right away he was impressed by the fact that I was making them on my own and not just buying them from a store. I told him that I had all the ingredients on-hand and that they were, well, easy! And even better, budget-friendly. They have a southwestern flavor to them, but tasted great with some cheese and some spicy ketchup (HINT: try mixing sriracha and ketchup. You won’t be disappointed). Now that I’ve gotten my feet wet with making black bean burgers, I can easily see different ways of adapting them for whatever ‘tastes’ we’re feeling that particular evening. If I can make and eat a veggie burger and like it, I think that anyone can! Last summer, as you may recall, I began to dabble with the ‘art’ of canning. I’m already drooling just a bit in anticipation of making my pickled sweet onions again this year. In addition, I’ve been able to can diced tomatoes, salsa, pickled jalapenos, cucumbers and homemade turkey broth. And then, there’s the beets. I tried to pickle beets last year and while yes, it did work, their flavor and color was a bit ‘meh’. I even forgot about a jar of them in the refrigerator – while they did smell okay when I opened the jar last week, the color was gone and my digestive system was not going to take any chances. I love pickled beets in my salad and being a pickle fanatic, I knew I had to give this another go. Makes 2 quart-sized jars of beets. Fill a large saucepan with water and set on stove to boil. Wash off your beets. Cut off the leaves as well as the root. Place beets into the boiling water and boil until the beets soften – between 1 & 1 1/2 hours. Remove from water & let cool. WHILE THE BEETS ARE BOILING – in a seperate saucepan, combine 1 cup of water & the rest of the ingredients and bring to a boil. This is your pickling brine and is a bit stinging to the nose. Once the brine is boiling and the sugar has dissolved, reduce the heat to a simmer & cover. Simmer for 30 minutes, then remove from heat. Once your beets have cooled, peel them by running them under cold water & scraping off the skins. Then, either cut them into slices, or dice if you like them in smaller pieces. Set out your large jars. If you have a canning funnel, you’ll want to use this too – it makes life a lot easier! Alternate laying the beets with the brine mixture into the jars. Once all beets are in, top off the jars with the rest of the brine. Leave the lids sitting on your counter until they cool down to room temperature. Once they’ve cooled, put the lids & bands on, and set in the refrigerator overnight. After 24 hours, they’re good to go! Look at how bright they are! 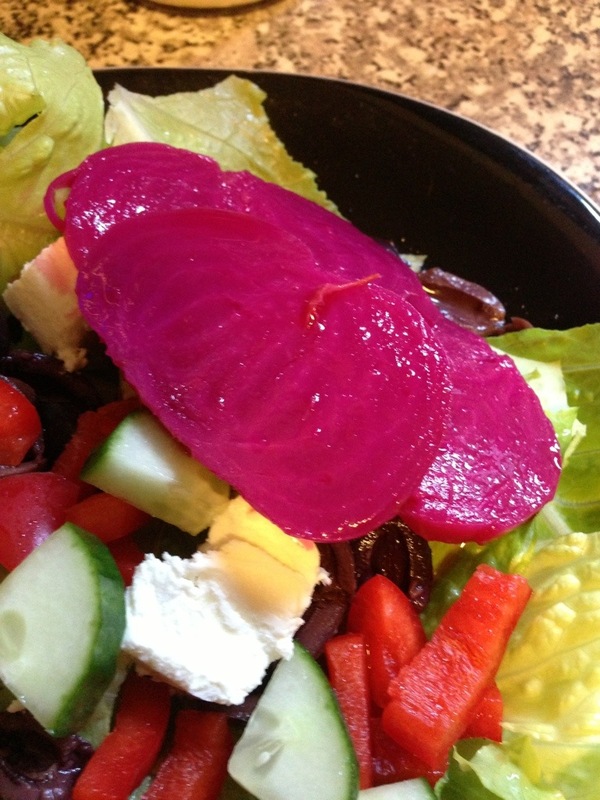 We tried the beets last night on our salads – wow. I know that ‘eating a rainbow’ is a new trick to get kids to eat vegetables – hell, I think it would have worked on me when I was a kid, but that didn’t exist in the late 80s – but look at the color on those beets! They are so unbelievably bright magenta. What kid wouldn’t want to try those? This recipe caught my eye because it uses a bulb of fennel. I received this in our CSA and while many of you posted some great ideas for its use, I’m still intimidated by the licorice-y aroma & wasn’t too enthusiastic about making a full dish out of it (yet – I promise I will get there someday!). The fennel adds some depth to the beets and really takes it up another level. On another note, any time I talk about pickling something, my husband retorts with the phrase, “We can pickle that!” from Portlandia. If you have a goofy sense of humor and/or love Fred Armisen, you may enjoy the video below.